In March 2016, Leeds Library and Information Service became the only library authority in England to be honoured at the National Coding Awards. The two ‘Highly Commended’ awards were in recognition of events held as part of National Coding Week 2015. 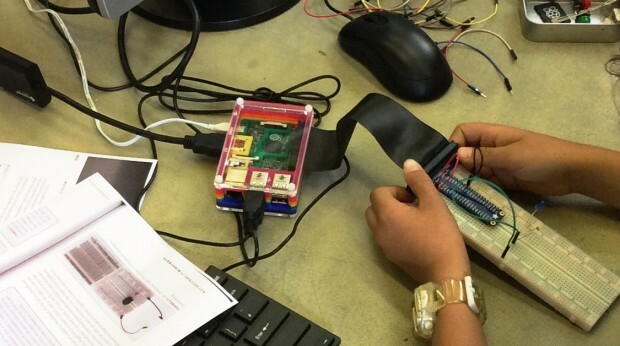 Why get involved in National Coding Week? One of the aims of National Coding Week is to build coding skills to address the digital skills gap in the workforce. 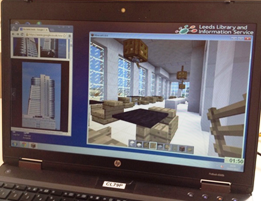 For many years, staff in Leeds Libraries have delivered sessions to improve people’s digital skills. In particular, our IT for Employment sessions and Work Club sessions help people to look for work and apply for jobs online. We had never delivered coding sessions for adults before but we knew this was a growing area of interest. The EU estimates that there will be up to 1.3 million unfilled digital jobs by 2020, some of which will require coding skills. 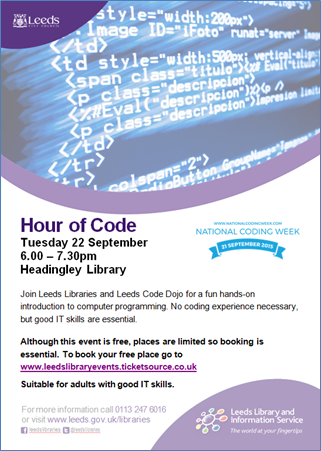 National Coding Week gave us the perfect opportunity to deliver a new session and hopefully attract a new audience. To get a better idea of how to design a coding session for adults, we spoke to Grant Crofton from Leeds Code Dojo. This is a group dedicated to programming and focussed on practical coding sessions where people learn by doing. Leeds Libraries have always helped people to be creative, discover new ideas and learn new skills. The innovative digital activities described here are helping us to adapt that traditional role to attract new audiences.